A truly spellbinding painting kit. One heavenly Pegasus with sweeping wings and flashing hooves, and one delicate prancing unicorn… What could be more magical? 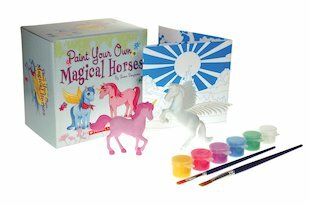 A little box of enchantment for you to bring alive, which comes complete with paints and a pretty background scene to colour. Contents: unicorn figure, Pegasus figure, 2 paintbrushes, 6 acrylic paints and a folding background scene.